Guinn v. United States (1915) held the “grandfather clause” enacted by the Oklahoma State Legislature invalid because it violated the Fifteenth Amendment to the United States Constitution. The Fifteenth Amendment, the last of three post-Civil War Amendments ratified to end slavery, endowed the rights of citizenship and the right to vote on freed African American slaves. The amendment specifically declared that the rights of citizens of the United States to vote shall not be denied or abridged by the United States or by any state on account of race, color or previous condition of servitude, and that Congress shall have power to enforce this Article by appropriate legislation. “Grandfather clauses” enacted by Southern states to limit black voting in the post-Reconstruction era, and clearly after passage of the Fifteenth Amendment, were implicitly designed to discriminate against potential black voters despite the absence of any overt language referring to race. Guinn v. United States was one of a cluster of cases decided in the second decade of the 20th Century in response to efforts to deny voting rights to Southern African Americans. 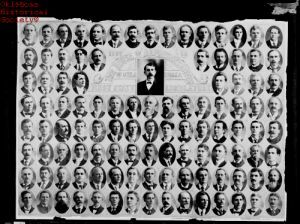 At the time of its statehood in 1907, Oklahoma’s original Constitution allowed men of all races to vote. Within one year of statehood, however, the legislature amended the original State Constitution to provide for a literacy test, e.g., the ability to read and write any section of the Constitution of the State of Oklahoma. That provision exempted two classes of individuals and their descendants from the requirement: 1) male citizens who were born on or before January 1, 1866 were entitled to vote; and 2) male descendants of people who at that time resided in a foreign nation were also allowed to vote. This provision allowed white U.S. citizens, as well as European immigrants and their descendants, to cast ballots. The provision also stipulated that a lineal descendant of males in these categories shall not be denied the right to register and vote because of their inability to read and write. The effect of the state constitutional provision was to prevent former male slaves and their descendants from voting since the vast majority of black males could not vote on January 1, 1866. In 1911 the United States successfully obtained a conviction against Frank Guinn and J.J. Beal, two Oklahoma election officers charged in federal court with violating federal election law by denying blacks the right to vote under the provisions of the grandfather clause. Guinn and Beal appealed their convictions, but they were upheld by the United States Supreme Court in Guinn v. United States. U.S. government attorneys, however, narrowed their argument in Guinn v. United States, only to the validity of the “grandfather clause” itself, conceding that literacy tests were acceptable if written to be racially neutral. In doing so, the Court recognized the States’ long accepted rights to determine terms of qualifications to vote as long as they did not violate the Federal Constitution or legislation to enforce the same. Thus, despite this victory in principle for African American voting rights, Guinn itself did not immediately enfranchise Southern blacks. Guinn v. United States, 238 U.S. 347 (1915); David Bernstein and Ilya Somin, "Judicial Power and Civil Rights Reconsidered," George Mason University School of Law Working Paper Series, Paper 9, 2004. Guinn v. United States, 238 U.S. 347 (1915); David Bernstein and Ilya Somin, “Judicial Power and Civil Rights Reconsidered,” George Mason University School of Law Working Paper Series, Paper 9, 2004.